1 die was used to determine the level of the horizontal line, starting from the center of the painting (e.g. odd = up, even = down and 2 = 2 degrees off level). The vertical line is at an angle of 90 degrees on the horizontal line. Sizes of rectangles are determined by dice via vertical / horizontal axle, starting from the center: 1 = 7cm, 2 = 7,5cm, 3 = 8cm, 4 = 9cm, 5 = 10cm, 6 = 10,5cm. 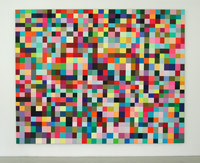 The painting exists out of 891 rectangles = 891 different colours. 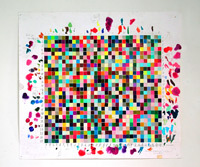 Colours were chosen blindfolded from a reserve of 1.012 solid colours from the Pantone Colour Specifier.